Is “Ambient Data” from Social Media Channels Useful for Funders? Jacob Harold, “Nonprofits Master “Medium Data” Before Tackling Big Data.” Harvard Business Review, March 2013. Urges nonprofits to focus on sharing and using basic information about who they are, what they’re doing and what’s happening, before tackling big data. Patricia Patrizi, Elizabeth Heidi Thompson, Julia Coffman, and Tanya Beer, “Eyes Wide Open: Learning as Strategy Under Conditions of Complexity and Uncertainty.” Foundation Review (Vol 5:3) Makes the case that most foundation strategies are unfolding in complex and dynamic environments, and foundations need a more committed approach to learning and strategic adaptation. The convening used participatory methods to identify topics for small group conversations related to the theme and was expertly facilitated by Allen Gunn from Aspiration. ( I wrote a reflection last week about the facilitation techniques here). One of the themes that bubbled up was the role of ambient data from social media channels and I agreed to lead a discussion on: How useful is this data for foundations? Are there methods and tools in the nonprofit and philanthropic sector for using it effectively? I got to facilitate a deep dive with a dozen folks and here are the takeaways from the discussion. We came up with the term “Ambient” data to describe unstructured data out that is generated through social media channels – tweets, status updates, comments, etc. There is not much value in the raw data unless you have the tools and skills to synthesize it. The data itself can be biased because it comes from a sampling of people who use social media or what some called a “self-selection bias,” so the data may not be representative of a total population – only specific locations or demographics. Also, in some places of the world there is lower adoption rates of social — for example in very rural areas of the developing world – where this data would not be useful for informing a funding strategy. The professional tools for monitoring and analyzing social media data can be expensive and pose a steep learning curve. It would be useful to have a landscape study of who is doing what in terms of using social media ambient data in the nonprofit and philanthropy sectors. The group identified a few organizations that are using it well, but would it great to have a deeper field understanding of where we are with this technique. We identified several great examples of nonprofit using social media data for decision-making, mostly to support communications strategy. The Red Cross is using social media data during disasters and launched its digital operations center in 2012 that provides a physical home for their social media monitoring. The Red Cross Digital operations center has big monitors reminiscent of NASA’s Mission Control and it uses customized, enterprise level professional software like Radian 6 to capture and analyze the social data stream. Social Media command centers are more commonly found in the corporate center for these uses. Patrick Meier has this excellent “behind the scenes” post from April, 2012. He points the common challenge in using social media data for emergency response: scaling. There is so much data coming in at a fast past, with 4,000 tweets per day – a number that skyrockets during a disaster. The American Red Cross can’t be everywhere at the same time. The other application for nonprofit communications is using ambient social media data to inform advocacy campaigns. Upwell, an organization incubated by the Ocean Conservancy and that works in a different way to support Ocean Conservation is using social media data, campaign experiments, and failing fast and learning fast to get impact. Here’s a blog post by Rachel Dearborn describing the process. Nonprofits and some foundations are using ambient social media data for brand reputation monitoring. 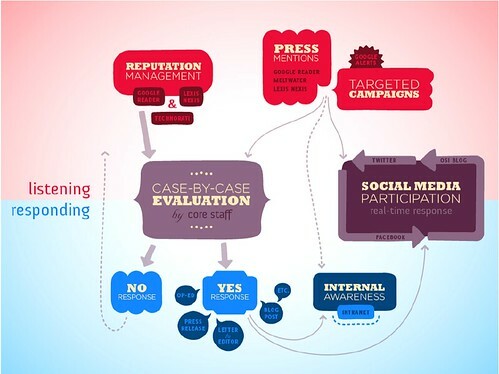 This diagram is from a presentation from the Robert Wood Johnson Foundation on their methods for using social media data. The group also mentioned an example in Europe where a neighborhood council was cross referencing social media data with location to find out what topics were trending in those neighborhoods as part of a planning process. Social media monitoring and data might be particularly useful for a foundation that is funding an advocacy area and to provide this data and analysis or fund it for a cluster of grantees working on a particular issue to support the communications strategy. We discussed some of the social media monitoring tools. The professional tools will cost money, but can process higher volumes of information. 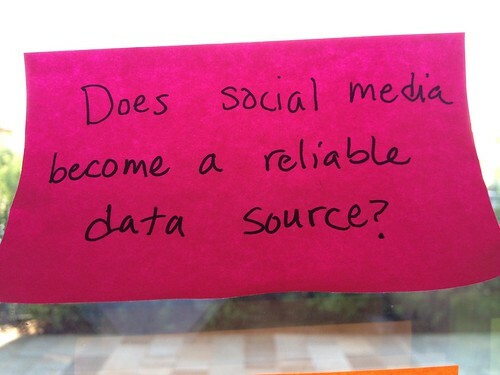 There are key questions to consider before investing in a social media monitoring solution. Your answers will help you determine the functionality you need and make the choice about what you are willing to pay for. TrustRadius has this report analyzing the different social media management tools, including those that can be used for monitoring ambient data. Is your organization making use of “ambient” social media data to inform its communications or engagement strategy? How are you using it to inform decision-making, action, and real-time evaluation? Please share your thoughts in the comments. This is an interesting question: the use of ambient social media data for foundation. I keep thinking of the examples from the for profit world — stockbrokers, for example, that use sentiment analysis to make stock predications. How can foundations do something comparable? This is less about looking at the exact information but more about saying something like “these four communities are demographically alike, therefore we expect to them to be talking about certain social issues in the same basic way — the same amount of negative or positive sentiment, awareness, general traffic of chatter.” and then if one of the communities goes out of the trend line, dive in to see why. If nothing changed demographically (there are some number, say, of homeless as before, crime stats are the same) why did the sentiment or the amount of talk change. Was there a successful campaign? Is there a negative campaign? I guess what I’m saying is: I’m wondering if there is a case for using social media to establish benchmarks between communities and then diving in when there is a deviance in one of the communities. That way, may be foundations can find things that are working (or not) or problems that are emerging more quickly then by waiting for reports. Slightly different from what you are talking about but a use that may be valid for foundations. And, in general, I’ve been thinking about complex data. Not big, medium or small. but complex and varied and how we bring it together to get pictures of our community. Because, technically, that’s often what we are talking about complexity and not the sort of standard definition of big data (volume, velocity and variety). Thanks for thee post Beth. I will try to use what I can. As you say. There are some really expensive tools out there, but I think even if you cant afford these tools the structure and approach can be employed. Particularly like the Upwell diagram. You point out some challenges to use the data such as that the data may be biased. Did you have any thoughts on how to overcome these challenges and still utilize this information effectively? Steve: That’s something I’m researching now, but I think that this type of data will be useful to particular types of nonprofits. For example, those that work with disaster recovery like the Red Cross or advocacy organizations.